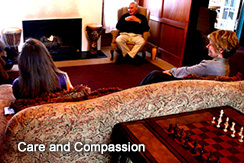 The Freedom Model Retreats offers an alternative solution to a residential drug rehabilitation center. A Residential Drug Rehabilitation Center is a level of care that entails that a client live or reside within a treatment facility for a specified duration of care. Care at drug rehabilitation centers can often include individual and group therapy sessions and span the confinement continuum from open campus, where you come and go as you please, to a lock down facility, in which you are not allowed to leave the vicinity. Families and the persons involved have a choice to enter into one of two distinctly different styles of drug treatment. The first choice is a 12 step based program or the second which is a freedom model program, such as the Freedom Model Program. A drug rehab that is 12 step based carries with it certain stigmas as the person is "diseased" or "sick", and for the rest of their lives need meetings with other "addicts" to keep them sober. With the 12 step model people are motivated by fear, and when fear is a constant thought in their mind then people are not able to move forward with a normal, successful, happy and healthy life. A residential program that is a non-12 step, non-treatment, freedom model program, such as the Freedom Model Program, does the direct opposite. Freedom Model's teaches the truth; that all people have the power to change their lives and build the life they want. The Freedom Model educational experience is designed to help each student identify areas in their lives they want to change and then start building a new life plan and strategize for their future. Choosing a residential drug rehabilitation center can be difficult, but seeking help for a substance use problem is a positive decision. Hopefully it is the first in a long line of positive decisions and actions wherein in a substance user takes control of his/her life for good.